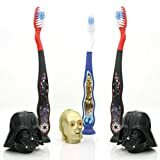 ORAL HYGIENE: Sanitary toothbrush holder that keeps your toothbrushes suitably-covered, yet well-ventilated for quick drying. Ideal for kids and for adults. STICKS PERFECTLY: Well-designed toothbrush case with suction cup. 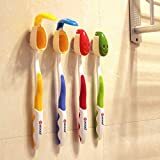 Perfect wall-mounted toothbrush holder that can be dismounted with ease. HANDY: Set of light-weight and compact travel toothbrush holders. Suitable for home, travel, office, or even as a camping toothbrush holder. Eliminates the need to place toothbrush on unhygienic surfaces. 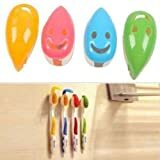 DURABLE: BPA free toothbrush holder set made of high-grade, long-lasting material. Suitable for regular toothbrushes of all sizes (not electric ones). Shipped in random vibrant colors. DISHWASHER-SAFE: Order this hygienic toothbrush holder that can be easily washed in the dishwasher for complete sterilization. 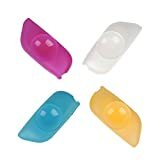 4 assorted colors – Pink, White, Yellow, Blue. 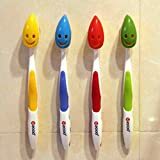 Flexible, durable, washable, reusable and soft toothbrush protector. 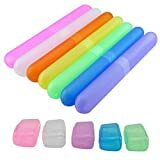 100% Food-grade BPA-free silicone case with suction cup, hygienic design, no harmful. BEST GIFT – Protect your family’s toothbrushes from germs with hygenic, anti-bacterial covers. Perfect toiletry essentials for the family or home & office, outdoor or travel. Services commitments: our worry-free 30 days money back guarantee 12-month warranty and lifetime friendly customer service.